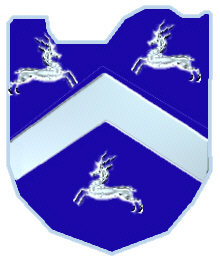 Coat of Arms: A blue shield with a silver chevron between three silver antelopes. O'Duirnan means "Son of the Fist" in Gaelic, hence the alteration by some O'Duirnans to "Cuffe." Ó Duirnín, anglicized Durnin, had become Cuffe in some places The fact that Dornan as well as Durnian and Durnan, are recorded as synonymous with Durnin in Louth and east Ulster makes differentiation between Ó Duirnin and the The English occupative surname Dyer appears frequently in mediaeval Irish records as le Deyer etc., but it has no connection with the name now under consideration. You have reminded me of something that I should initially have included--that O'Duirnan means "Son of the Fist" in Gaelic, hence the alteration by some O'Duirnans to "Cuffe." This leads to questions as to our lineage. It seems highly likely that we are descended from Yaakov, but whether through the House of Yisrael or the House of Yehudah, who knows? There is one question simmering in the back of my mind waiting for an answer from our past: Does the "fist" of which we are the sons refer to the fist around which the midwife wrapped a scarlet ribbon, that is, Zerah ben Yehudah's fist, when Peres was born first after Zerah had put his hand out? Thank you for all the time and effort you are putting into this work!